Whether you're married on an off-peak day -- aka not Saturday -- or a less popular time of year (generally late fall through the winter), you'll probably score a sweet venue for a steal. This isn't an easy thing to do -- until you see the savings start to accrue exponentially. 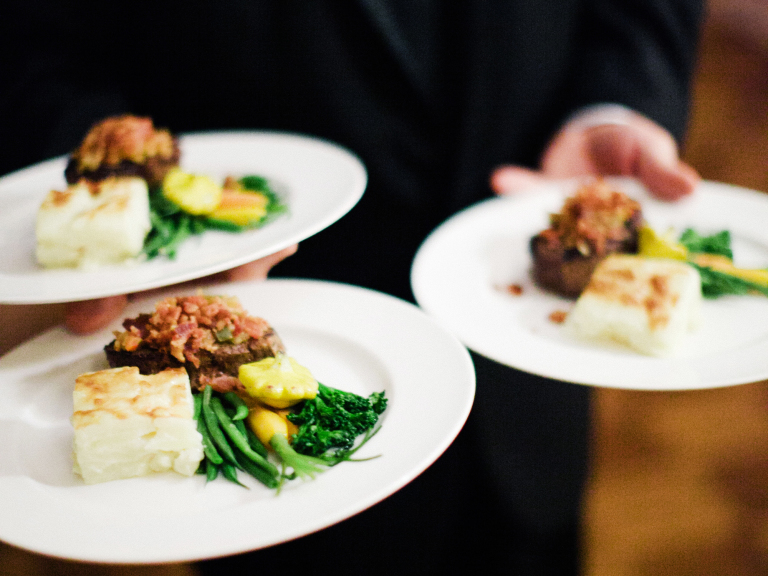 You'll seriously save on catering by feeding less people and on your invitations (not to mention postage). And having a smaller space also means less décor and rentals. If you're a big Father of the Bride fan, you might have your heart set on a wedding at home. Well, George Banks flipped out throughout the film for a reason -- a bloated budget. Between rentals on everything from tents to toilets, creating an event where they usually aren't hosted (whether it's a home or a bare-bones venue) costs a lot more than a traditional venue. Pretty displays (or plates) of mac and cheese and BBQ chicken are guaranteed crowd-pleasers. Seriously, ask any potential guest -- whether they're eight years old or 80 -- if they'd prefer crispy fried chicken or a baked breast with a fancy sauce -- we think we know the answer. Fun food makes for a fun party -- and is totally on trend right now. Nothing is sadder to a bride or groom on a budget than seeing a ton of half-finished champagne glasses littering the reception tables after a toast. People can toast with anything they're drinking. If you want bubbly, go with champagne's lower-priced, but still perfectly chic and tasty, cousin -- prosecco. Strawberries and other fruits and veggies out of season cost more and are not as tasty--a lose-lose situation for your menu and your budget. So if you're getting married in July, by all means, give strawberry shortcake a place of honor on your dessert table -- but if your nuptials are in the fall, serve mini pecan pies as a nod to the season's biggest holiday.